Cue drum roll…. Helmet Cam! To be completely honest, there are a few downsides to experiencing life as a helmet. It’s not all checking out cute bikes and waiting for the next sunny day. 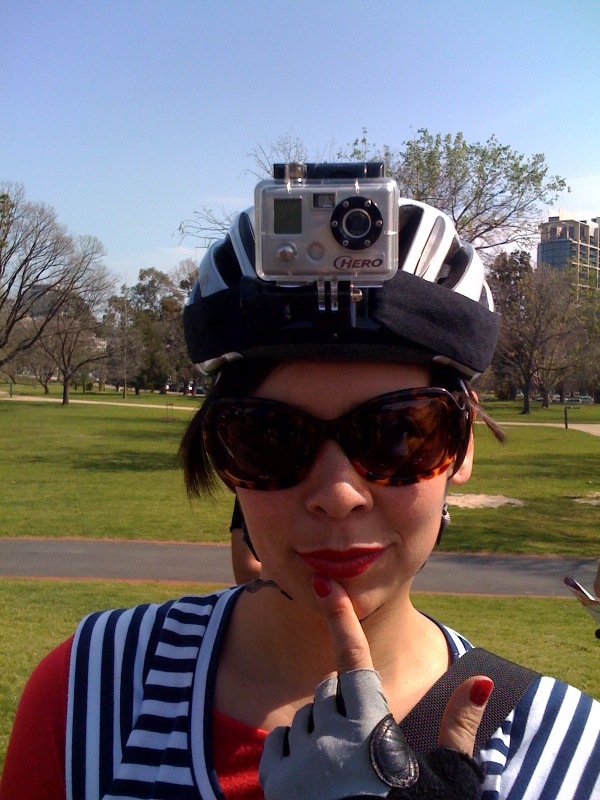 “H-cam” was more than a little tricky to operate, since it’s virtually impossible to tell if the damn thing is on without taking your helmet completely off and staring deeply into the lens. The resulting footage is terrifying and I, for one, never need to see up my own nose again. Or the noses of various friends I asked to do likewise. Oh, and the nifty rubber backed head attachment thing actually covers up all the air vents round the front of the helmet making you physically hot too. Adding to these various downsides, you also look like a total dork with a camera on your head. Still. Never let it be said I’m not willing to empathise with an inanimate object. When I work out how to cut down half an hour of people’s butts down into about, maybe, um, 20 secs, I’ll even pop up some footage. For those considering a career as a helmet.